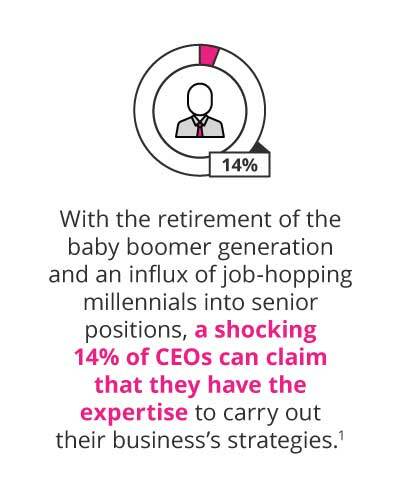 With the retirement of the baby boomer generation and an influx of job-hopping millennials into senior positions, a shocking 14% of CEOs can claim that they have the expertise to carry out their business’s strategies.1 This widespread concern makes it more important than ever for businesses, young and old, to incorporate executive leadership training programmes to protect them in the future. Online learning (or e-learning) is beneficial because it can be flexible and slot into an executive’s free time, something which many face-to-face approaches can’t do. 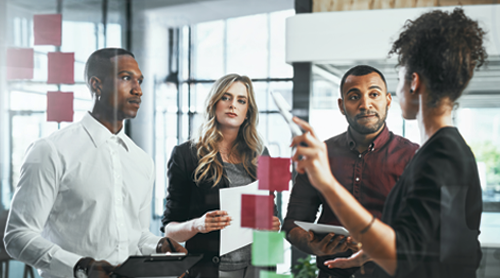 Executives can follow a self-study route, learn from or with a facilitator or peers, or take part in an online formal development programme.12 This means that online learning is perhaps best suited to maintaining efficiency and a work balance. It is also, generally, more cost-effective than face-to-face learning programmes, and quite easily allows for informal training to support its progression and goals due to its flexible nature. This approach blends face-to-face and online learning, where one method supports the other in a holistic programme.13 Many companies might find themselves following this route, for the simple reason that it blends more traditional approaches with modern approaches . There are various ways to engage this learning method, such as incorporating a formal face-to-face mentor with an online programme, or supporting a part-time classroom-based programme with online material.14 The benefit of this approach is that executives can receive some of the benefits from both approaches, but are still able to structure a flexible programme within a business’s budget. How many executives need training? Will our budget support a formal training programme? Or do we need to plan informal activities until we have budget? What skills and values do we want to instil and motivate in our executive leadership? How does our executive leadership like to learn? (I.e. face-to-face, online, “on the job”, or a blended approach). While CEOs are claiming to be ill-equipped to fulfil their business’s strategies, only 18% of companies are investing in analysing these kinds of shocking realities.18 These statistics highlight the necessity to build into current leaders and foster a culture of lifelong learning, where executives can lead the charge of benefitting from training and development for the teams under them. 1 Caprino, K. (Feb, 2018). ‘The changing face of leadership: 10 new research findings all leaders need to understand’. Retrieved from Forbes. 2 (Nd). ‘A guide to writing an executive development plan (EDP)’. Retrieved from U.S. Department of Labor. Accessed 14 March 2019. 3 (Nd). ‘What is an executive development program?’. Retrieved from Learn.org. 4 (Nd). ‘A guide to writing an executive development plan (EDP)’. Retrieved from U.S. Department of Labor. 5 (Nd). ‘A guide to writing an executive development plan (EDP)’. Retrieved from U.S. Department of Labor. 6 Turtle, K. (Nov, 2016). ‘Why opt for an executive MBA?’. Retrieved from TopMBA. 7 (Nd). ‘A guide to writing an executive development plan (EDP)’. Retrieved from U.S. Department of Labor. 8 (Nd). ‘What is action learning?’. Retrieved from WIAL. Accessed 14 March 2019. 9 (Nd). ‘A guide to writing an executive development plan (EDP)’. Retrieved from U.S. Department of Labor. 10 (Nd). ‘A guide to writing an executive development plan (EDP)’. Retrieved from U.S. Department of Labor. 11 Weldon, E. (Nd). ‘Helping faculty build their executive education skills’. Retrieved from Uniconexed. Accessed 14 March 2019. 12 Weldon, E. (Nd). ‘Helping faculty build their executive education skills’. Retrieved from Uniconexed. Accessed 14 March 2019. 13 (Nd). ‘What is blended learning?’. Retrieved from Mind Flash. Accessed 14 March 2019. 14 (Nd). ‘What is blended learning?’. Retrieved from Mind Flash. Accessed 14 March 2019. 15 Erturk, E. (Oct, 2015). ‘Role play as a teaching strategy’. Retrieved from Research Gate. 16 (Feb, 2014). ‘3 Benefits of making role-play part of training’. Retrieved from Training Mag. 17 (Nd). ‘Leadership skills training: the ultimate guide’. Retrieved from IMD. Accessed 14 March 2019. 18 Caprino, K. (Feb, 2018). ‘The changing face of leadership: 10 new research findings all leaders need to understand’. Retrieved from Forbes.